I really like this plush coat! It looks particularly graceful and luxurious. And it's really warm, just like in a quilt. Sometimes when I go to the bathroom at night, I wear this coat directly, which is especially warm and convenient. When worn outdoors, the shape is particularly strong. The fur on the clothes is really soft and comfortable. And with any other match is quite good. I like it. . The jacket looks like it is on the model's photo. Open front. Stylish lapel. The drape of the jacket. length. Everything is the same as advertising. It's soft, beautiful, and fun, just like a furry blanket. I bought this for a devil costume and I received a lot of compliments , I ordered a medium and it fit a little bigger but that was the look I was going for . I think this is a good outerwear for costumes or non special events. for the price you cannot beat it . This is actually one of the warmest jackets in my closet! Too soft, warm and comfortable. 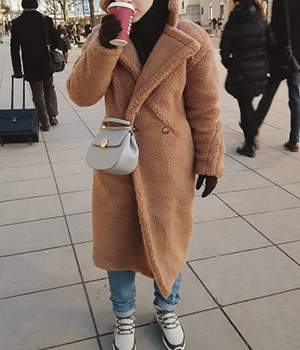 I have seen many of my favorite fashion bloggers wearing teddy bear jackets, but the length of this product is unique. I like it. The product arrives on time and is very clean. This is definitely the staple food in my wardrobe this winter, I highly recommend it! This is a nice looking coat. fully lined, comfortable. Great to dress up or down. If your looking for something different to give you moderate warm and coverage for either an evening dress or jeans, I would highly recommend this. Love it!! Very pretty, soft and comfy! 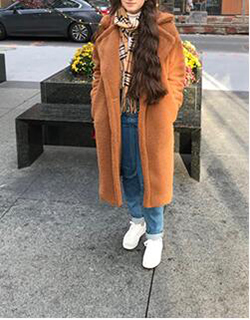 Hometown winters are very cold & the material is very nice, good quality, enough warm for the winter.I am very happy with my purchase, would definitely recommend, also may purchase another one for my mom!